People who like their adventures to include mud, trails and the great outdoors, the 2016 Kawasaki Teryx® side x side should be on the top of their shopping list. 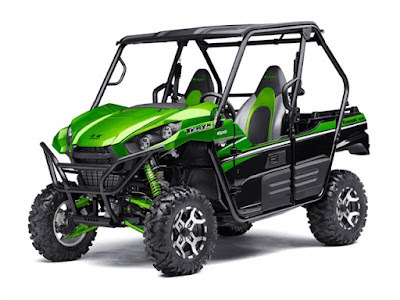 This incredibly versatile and sporty recreational utility vehicle combines great off-road ability and impressive comfort with legendary Kawasaki durability and quality. And for the 2016 model year, it has received a host of upgrades that will make it more appealing than ever. New features include a redesigned front face that gives it a more aggressive persona to accompany its off-road toughness. The dashboard layout is new, and tilt steering is standard on all models, plus a thicker, sportier steering wheel for more driver comfort and confidence as well as standard Electric Power Steering (EPS) on all models. Further updates see the Teryxfamily getting new tool-free adjustment for the driver’s seat as well as new optimized setting for its Fox Podium 2.0 shocks. Add bigger 14” wheels on the Teryx LE model, and four powerful LED headlights on the LE and Camo models, plus a Kawasaki STRONG three-year limited factory warranty, and the 2016 Kawasaki Teryx side x side is an unbeatable package. Transferring all that torque to the ground is a Continuously Variable Transmission (CVT) with a centrifugal clutch assembly,and a three-mode electronically selectable four-wheel drivesystem with access to either 2WD (light steering, great handling), 4WD or 4WD + Front Differential Lock. The latterhelps to provide optimum traction in difficult conditions by simplyrotating a dash-mounted switch. The CVT is known for its quick response and direct engine “feel” in sportier riding situations, and its unique engine braking ability can increase driver confidence on descents, while turning and in rough conditions. So whether it’s climbing a rocky trail, crossing a stream or just hauling down a wide-open track, the Teryx side x side has theideal drivetrain mode to handle it. Easy, low-effort and precise steering are hallmarks of the standard Electric Power Steering (EPS) system in the 2016 Kawasaki Teryx side x side. The Showa-built system eliminates the need for a traditional power steering pump found on most of the competition, so steering inputs do not rob the engine of power. In fact, the EPS is only active when the engine is running, so there’s also limitedbattery drain. New for the 2016 model year is a tilt steering column available on all models. It allows the steering wheel to be tilted to a position that suits the driver, or can be moved out of the way to ease cabin access when wearing work tools, for example. To reflect its sporty performance and handling, all Teryxmodels have received a thicker steering wheel. This is designed to be more comfortable in the driver’s hand, giving more confidence on trails and improving the overall feel of the driving experience. The Teryx side x side’s durable Double-X frame constructiontakes technical terrain in its stride. The rigid, square tube chassis effectively combats flex to help provide superior handling over rough ground. This stout frame was designed using detailed computer analysis and plenty of off-road testing to create the Double-X design. It features two X-shaped crossmembers bridging the frame’s box structures from corner-to-corner for maximum strength and optimum durability. The extremely tight 16.7ft turning radius makes maneuvering in close quarters a cinch – a real benefit over some of the competition that can be forced to make multi-point turns in the same amount of space. The frame is also reinforced by the Roll-Over Protective Structure (ROPS), which extends all the way out to the edges of the bodywork to maximize cockpit space and help shield the chassis and bodywork in the event of a rollover occurring. The Teryx side x side has underbody engine guards that offer an added measure of protection by shielding vital components; their smooth reinforced surfaces act as a skid plate when it might be necessary to grind over the occasional obstacle. This impressive chassis package is further enhanced with a wide-track/wide-body design, which contributes to superb handling characteristics. The wide track helps resist body roll during cornering and boosts its ability to navigate rough terrain. Mid-engine placement also helps by centralizing the vehicle’s center of mass, which reduces the turning inertia and promotesfluid direction changes. Large 26” Maxxis Bighorn 2.0 tires offer the type of ride comfort, control and traction you would expect from a Teryx side x side. Their construction and tread design helps maximize traction, while optimizing driver feedback during cornering. The Teryx side x side has an 85.8” wheelbase, contributing to its tight turning radius and overall agility. The vehicle also offers a substantial 11.2” of ground clearance, helping to prevent it from high centering when cresting a ridge or obstacle. The high approach and departure angles (79– and 65-degrees, respectively) also reduce the possibility of fouling the front bumper when approaching a steep slope, or scraping the tail when exiting. The independent suspension on the Teryx side x side incorporates one of the best names in the high-performance suspension business: FOX. This means that stout steel A-arms at all four corners are mated to adjustable FOX Podium 2.0 remote reservoir coilover shocks, which are adjustable for spring preload and 24-way compression damping. They allow the driver to tailor the ride to the terrain or the personal preference and offer 8” of plush travel up front and 8.3” out back, giving the Teryx side x side plenty of trail-taming comfort.And new settings for the shocks mean the vehicle has even more composure at high and low speeds. Kawasaki and FOX incorporated a dual-mode design ideology so the adjustable FOX Podium 2.0 coilover shocks provide everything from cruising comfort with two passengers and a full cargo bed, to sport-style bump absorption when driven solo. It’s a difficult combination to get right, but the FOX Podium 2.0 shocks get the job done by maintaining consistent, progressive and fade-free damping. With the performance and handling potential of the Teryx side x side, consistent brake performance is essential, and the Teryxside x side delivers with high-performance hydraulic discs up front. These use 200mm rotors gripped by dual-piston calipers for exceptional feel and stopping power. The brakes are recessed within the wheels to help keep them free from dirt, rocks, water and debris, while sturdy steel-braided brake lines help keep the pedal feeling crisp and progressive. At the rear, Kawasaki employs its unique sealed internal wet brake, which features internal components that are completely sealed from mud, water, dust and debris. The result is powerful and enhanced braking performance whether descending hills or running on trails, wet or dry. 27.6 x 43.3” cargo bed is 10.4” deep and boasts a heavy-duty 600 lb payload capacity. The cargo bed has a flat bottom that is big enough to hold a large cooler, several spare fuel cans or other essentials. The bed also features the ability to add Kawasaki’s optional tool snap-mount system, which allows quick-mounting of Kawasaki Genuine Accessories and/or tools to the bed rails. Four tie-down loops help secure the cargo, and two water-resistant rear storage compartments offer 48 gallons capacity. The Teryx side x side also features a latching tailgate, which can be removed without tools if greater capacity is required.The tailgate also features molded drink holders for added convenience. A 2” hitch receiver is standard equipment. This allows the Teryx side x side to tow up to a substantial 1,300 lb once equipped with the optional draw bar. Convenience features on the 2016 Kawasaki Teryx side x sideinclude two DC power outlets providing up to 120 watts of peak electrical power, while nearly eight gallons of fuel capacity and impressive fuel economy mean the Teryx side x side has substantial range, enough for a long day on the trail. There’s also a handy cab roof (sun top) to maximize comfort (standard on the Teryx LE and Teryx Camo models, optional on the TeryxEPS model), plus a conveniently located beverage holder for each occupant. New this year is a restyled dashboard layout that incorporatesfour accessory switches, allowing Teryx side x side owners to operate their chosen optional Kawasaki Genuine Accessories, such as a winch, auxiliary LED lighting, etc. The dashboard is also able to accommodate the Kawasaki Genuine Accessories audio system to provide music or news throughout the day. Anumber of convenient storage pockets were also incorporated into the new dash design to increase its utility. The Teryx side x side’s aggressive new styling matches its performance. It includes a new hood and scratch-resistant front bumper. Along with its angular fenders, the Teryx side x sidehas a look that says “sporty” and “functional” at the same time. To prove the point, the aggressive-looking hinged hood opens for ease of maintenance and is finished in automotive-quality paint. New lightweight polished 14” cast aluminum wheels on the Teryx LE model could garner a fair share of attention at any custom car show, but it doesn’t stop there. The Teryx LE also features a strong tubular-steel front brush guard, while both the Teryx LE and Teryx Camo models now receive four new high-intensity LED headlamps that are engineered to keep the path well-lit long after sunset. Textured paint on the brush guards and ROPS cage help keep the Teryx LE looking sharp for a good long time. Both the driver and passenger will enjoy riding in the Teryx side x side during a long day, because it’s one of the most comfortable side x sides in its class. Its roomy interior gives the driver and passenger ample room, with plenty of hip, shoulder and legroom. Three-tone high-backed bucket seats feature high-quality cushioning and cold-resistant seat material for all-day plushness. The adjustable seats eliminate the need for a headrest and feature wraparound ergonomics to hold driver and passenger firmly in place. The driver’s seat can now be adjusted without using tools, allowing different-sized drivers to comfortably get behind the wheel. And when the going gets rough, automotive-style three-point seatbelts offer a high degree of security, helping to keepthe driver and passenger in place. Shock-absorbing comfort mounts and an anti-cinch feature on the seatbelts also help prevent over-tightening when the belts lock during sudden deceleration (or when the tilt sensor is activated). Unlike many of its competitors, the Teryx side x side features premium factory-designed secure latching, automotive-style doors that are easy to use, look good and offer a high level of protection from the elements. The instrumentation includes a multi-function electronic display that provides an array of useful information: speedometer, fuel gauge, odometer and hour meter, clock and dual trip meters. There are also indicator lights for the2WD/4WD, front differential, parking brake, water temp and a fuel injection warning plus a reverse indicator – everything you need to know at a glance. The first model is the 2016 Kawasaki Teryx EPS model, which is equipped with advanced Electric Power Steering to help the driver maneuver at low speed and reduce terrain kickback as the speed increases. The Teryx EPS model is available in Bright White, which looks great on the aggressive lines of this sporty vehicle. Finally, there is the 2016 Teryx Camo model, which is equipped with standard EPS, four powerful LED headlights and a hard sun top. As its name suggests, the Camo model is finished in the authentic Realtree Xtra Green Camo pattern that makes it ideal for hunters, photographers, backwoodsmen or anybody who wants to maintain a low profile while off-road. When you look at all the features of the 2016 Teryx side x side, it’s clear there is no competition for its outstanding excellence. Yet Kawasaki did not stop with simply building the most capable, comfortable and durable side x side in the world; they backed it up with the Kawasaki STRONG 3-Year Limited Warranty! It’s well known that the premium engineering on the Teryxside x side makes it a long-lasting and dependable product. That peace of mind is further enhanced by factory-backed support for a full three years on every 2016 Teryx side x side! Strength. Power. Comfort. Convenience. Hauling and towing ability. Reliability. The Teryx family has been at the pinnacle of off-road fun and function since its inception, and the 2016model ushers in a new era of Kawasaki side x side performance, reliability and comfort! All Kawasaki Genuine Accessories are developed in conjunction with the vehicle to ensure fit and functionality. They include items such as a snowplow and several WARN winches. There is a fabric cab enclosure, fabric, plastic and aluminum roofs as well as full-length fabric doors. There is a cargo box system that secures to the cargo bed using special clamps. Teryx side x side owners can also purchase an audio system, auxiliary lighting, tow hitch balls, a full and half windshield as well as gun cases and a mounting system. To protect Teryxvehicles off-road, there is a full complement of underbody guards and skid plates from front to rear, as well as light guards, a rear bumper, fender flares and more.